It’s another smart air quality monitor that’s worth looking at for your home or office because it allows you to discover just how safe (or unsafe) your indoor air actually is now. The Awair is a compact device, measuring just 2 inches by 3.5 inches by 6.3 inches and weighs in at just one pound. It ships with a one-year manufacturers warranty included. Healthier air means better health overall and a stronger immune system. It improves breathing, provides better focus, and offers up a greater degree of comfort and peace of mind. 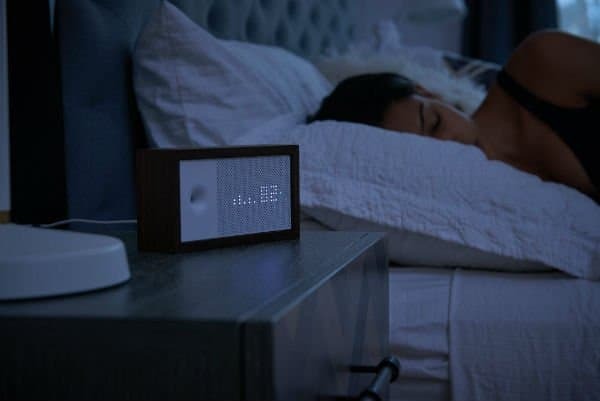 You can use the Awair air quality monitor to help you get better night sleep, improve productivity, and control any allergies you might have. 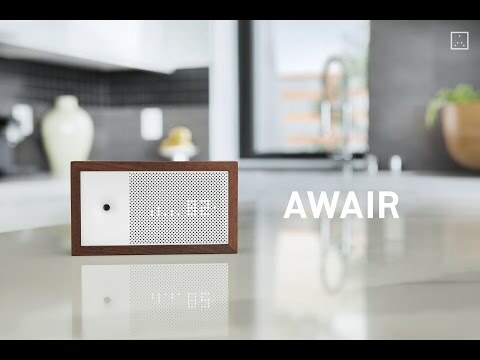 The Awair Indoor Air Quality Monitor tracks chemicals and toxins, dust, and carbon dioxide. 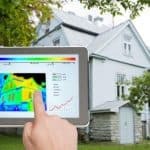 It also measures temperature and humidity and provides actionable tips and helpful insights you can use right away to begin to make things better. 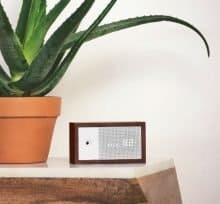 The Awair Indoor Air Quality Monitor is a smart device that easily connects with Amazon’s Alexa, Nest Thermostats, and IFTTT. What this enables you to do is to automatically activate other smart devices. This can be done to get up to date information from your Awair device, or in response to preset conditions like activating an air purifier when conditions warrant such automated action. One of the things that sets the Awair Indoor Air Quality Monitor apart from others is it’s made from natural materials, including 100% North American walnut timber fibers. Whenever you experience symptoms like allergies, eczema, asthma, or you just can’t sleep, there may be problem pollutants in the air. Awair tracks common airborne toxins and gives you usable recommendations to help you take corrective measures so you can start breathing healthier, cleaner air as soon as possible. There are five key elements that the Awair Indoor Air Quality Monitor tracks including dust (and other particles), VOCs, carbon dioxide, humidity, and temperature. It’s these specific areas that have the most damaging impact on your health and comfort. The impact of these toxins can be far-reaching and they can negatively affect your sleep, focus, mood, immune system, and respiratory health. Aware makes it easy to keep tabs on 5 important air quality metrics. Owning an Awair Indoor Air Quality Monitor helps you breathe easier, control allergies, increase personal productivity, sleep better, and live healthier. Step number one to enjoying healthier, cleaner air is to gauge the air that you and your family are routinely breathing. It may be good. But chances are, there are plenty of hidden dangers lurking about. 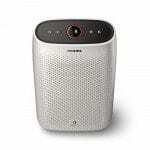 The Awair Indoor Air Quality Monitor will reveal the quality of your indoor air in real time. Air quality conditions can change quickly and Awair keeps track. Air conditions can change quickly and dramatically. You should never assume that it remains essentially the same in any dwelling. Pollutants come from a variety of sources including outside traffic, building materials, finishes on walls, floors and furniture – and several other things. The Awair Indoor Air Quality Monitor is not just a device that measures pollutants in the air. It can actually connect to other devices to adjust to your changing indoor air conditions. This is where the Awair shines. What I like most about this device is that you also get a number of helpful insights and actionable steps to improve air quality. The steps weren’t developed by just anybody. They are the result of a working partnership with the Mayo Clinic. So you know you’re getting useful and practical actionable steps from a reliable source – one of the elite names in all of health care on a global basis. Those tips provided are first rate too. Connecting to other smart products is easy and it’s a quick way to automatically achieve cleaner air inside. It’s intuitive and user-friendly. It also boasts a stylish design too. But it’s the technology built into every Awair unit that packs the biggest punch. It’s accurate insights, suggested actions, and triggering capability taps into the latest technology, making air quality assessment and control, something you can handle from your own smart phone or tablet. The LED display is perfect for a quick, at-a-glance reading. This lets you in on the quality of your air right away. There’s no need to dig further unless you want to and that’s where the app comes in handy. You can check out the actual numbers, view statistics over time, discover useful tips that can be implemented to improve your air. You can also adjust your settings or set off actions on any connected smart appliance. You can use multiple Awair units and connect them all to a single network. If you’ve got numerous rooms in your home with suspect air, this is the most effective way to get a handle on the big picture, so you can them begin to address it in an effective way. 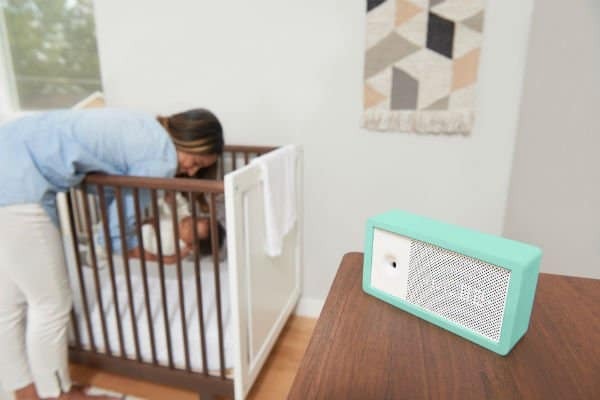 The Awair Indoor Air Quality Monitor is also available in a Baby edition. It is basically the same device, only the appearance is different. Instead of the wood casing, the Baby version comes in a copolymer casing, in either ocean blue or baby rose colors. Do You Have A Strong Connection? One often-cited problem with smart connectivity is the difficulty it presents for some buyers. 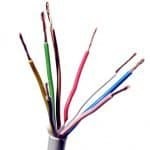 There are a couple of reasons for this and they include the service provided by your internet company, the router or hardware used to connect your Wi-Fi, and lastly, the device you’re connecting. With a quality service and up to date router, most connectivity issues seem to resolve themselves. We can no longer afford to take the quality of our home’s air for granted. Indoor air pollution is widespread and diversified and nobody is immune. Thankfully, the Awair helps us to get a handle on it – and then make the adjustments for us by triggering other devices like thermostats and air purifiers. The set-up process is quick, easy and intuitive and this attractive device would look great in any home. It’s sure to be effective in multiple ways and don’t be surprised if your new Awair becomes a conversation starter among visitors to your home.